Cisco Systems reported another tough quarter on Wednesday, saying profits fell by more than half and revenue declined by nearly 8 percent. The dominant networking vendor had scaled back expectations for the quarter and the coming year after a disappointing earnings report last November. At that time, it cited uneven economic conditions around the world and transitions in some of its product lines. For its second fiscal quarter, which ended Jan. 25, Cisco reported revenue of US$11.2 billion and net income of $1.4 billion, or $0.27 per share. That profit figure was down 54 percent from $3.1 billion, or $0.59 per share, a year earlier. Not counting certain one-time items, net income was $0.47 per share, down from $0.51 in last year's second quarter. Both that result and its revenue slightly exceeded the consensus estimates of financial analysts polled by Thomson Reuters, which were made after Cisco had warned of a revenue drop in the quarter. Wednesday's results followed a gloomy first quarter in which Cisco's revenue fell short of its own forecast and its profit declined from a year earlier. Right after posting those figures in November, Cisco warned that revenue in the second quarter would fall by between 8 percent and 10 percent. In December, the company cut its long-term revenue forecast. Over the next three to five years, revenue will rise by 3 percent to 6 percent per year, Cisco CFO Frank Calderone told a financial analyst conference. The company had been expecting between 5 percent and 7 percent per year over the long term. Macroeconomic factors loomed large in Cisco's account of the weak first-quarter results and forecast. Sales were dramatically lower in most of the company's important developing markets, executives told financial analysts. But transitions in some product lines also hit sales, they said. In the current quarter, revenue will again be lower than it was a year earlier, but only by between 6 percent and 8 percent, Chairman and CEO John Chambers said on a conference call Wednesday. "I feel a lot better where we are now versus where we were a quarter ago," he said. Still, he said the company will return to growth over "the next several quarters." Cisco specializes in capitalizing on change but still faces big challenges, according to Chambers. "Multiple transitions are occurring at the same time, requiring Cisco to transform on multiple fronts faster than we've done before," he said. 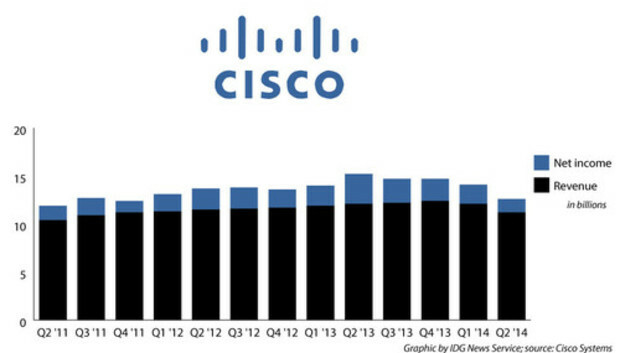 Cisco's woes continued in the second quarter in less developed countries. Across important emerging markets -- Brazil, Russia, India, China and Mexico -- product orders were down by about 10 percent, Chambers said. It's too early to identify a recovery trend in emerging countries, he said. Results in Europe are recovering but are still fragile in southern countries, according to Chambers. Orders were also down in the Americas, though up among U.S. enterprises. Worldwide orders from service providers were down 12 percent in the quarter, Cisco said. The company is shifting its video infrastructure business, customers are evaluating a new core router, and in mobile carrier infrastructure it's up against traditionally long sales cycles, Chambers said. The news was better in data centers and security, where Cisco logged more revenue and orders than a year earlier. Data centers are central to Cisco's effort to become the top IT company, with overall architectures built around products such as the UCS (Unified Computing System) servers and Nexus switches. Chambers said UCS continues to gain market share. Cisco took a one-time charge of $655 million during the quarter to remediate a problem with faulty memory components that Cisco put in some of its products sold between 2005 and 2010. The memory may fail, though Cisco said failure rates are low, and the company is working proactively to solve the problem, Calderone said. The market punished Cisco for the weak results, sending its Nasdaq shares (CSCO) down $0.92 to $21.93 in after-hours trading late in the day.